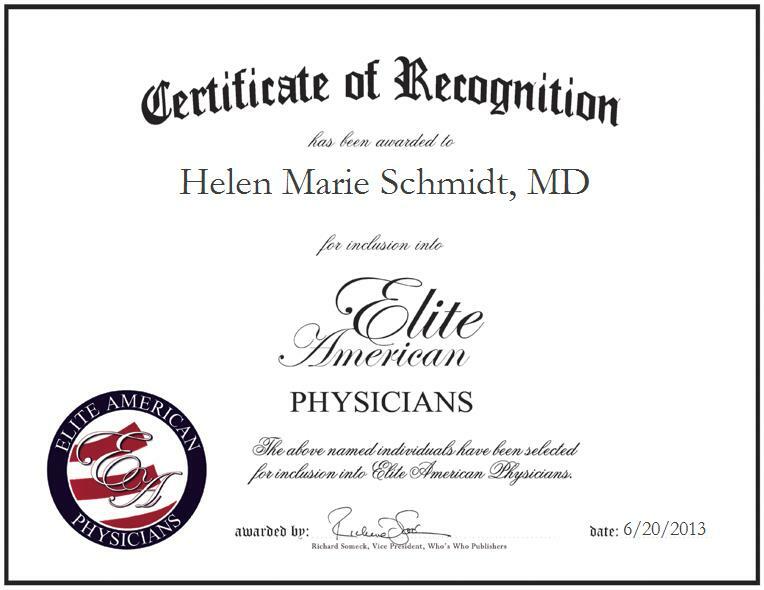 LIBERTY LAKE, WA, June 20, 2013, Helen Marie Schmidt, MD, Medical Director of the House Calls and Mobile Medical Clinic of Family Home Care & Hospice, has been recognized by Elite American Physicians for dedication, achievements, and leadership in health care. Over the course of an illustrious career spanning 50 years, Dr. Schmidt has made a name for herself by remaining committed to quality patient care. She has always been passionate about helping people. With a wealth of knowledge and experience amassed throughout the years, Dr. Schmidt feels that the most gratifying aspect of her career has been seeing young people whom she has had the privilege of assisting financially excel in their professions, and witnessing the success of those who have gone on to excel after receiving lifesaving medical care. Dr. Schmidt has been the medical director of the House Calls Mobile Medical Clinic since 2007. She served as a missionary in the Republic of Cameroon for 34 years, as well. She received her Medical Degree in 1963, when women were not allowed in medical school. While attending the Women’s Medical College of Pennsylvania, two out of one hundred women became physicians. Dr. Schmidt is a recipient of the Medal of Honor, as granted by the Republic of Cameroon, and the title of Physician of the Year, as granted by The Home Care Association of Washington.